For a decent pair of turntables and a mixer you’re probably looking at spending well in excess of £600, at least. But luckily if you already have an iPad you can download our new favourite mixing application called Djay. Now don’t let the rather cheesy name of the app put you off, Djay is an advanced turntable and mixer application which actually works. It stands out from similar offerings on the market because you can split tracks using Griffin’s DJ Cable, which means you can play tracks at the same time but hear them each in isolation. There’s a live record function, which allows you to save the mix to your iPad and there are tonnes of other features and effects within the app too, like echo and phase, as well as a great looping programme. Overall, the app is very responsive and the great thing about it is it doesn’t just mimic the look of a pair of turntables but it feels, responds and even sounds like the real thing too. The only thing that lets the Djay app and Griffin DJ Cable pairing down is that you have to use tracks that are already in your iTunes library, so if you usually rely on the likes of Spotify or Deezer to stream all of your music it’s frustrating that you have to buy extra tracks that you already have in playlists. There are some similar applications available, but Djay wins hands down when it comes to mixing tracks, as it’s just so versatile and produces great results. The Djay app is available from iTunes for £13.99. The Griffin DJ Cable is available from Apple for £17.95. 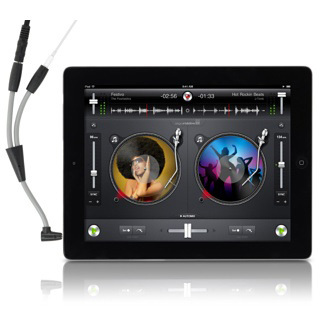 APP OF THE DAY: Djay is the ultimate mixing app for the iPad,so great !